This provocative book documents how national and global politics intersected to bring about changes in Brazil's environmental preservation laws. Luiz Barbosa argues that global forces coupled with two decades of military rule in Brazil led to policies that promoted deforestation for the sake of development, ultimately having devastating consequences for Amazonia's ecosystem and its native populations. 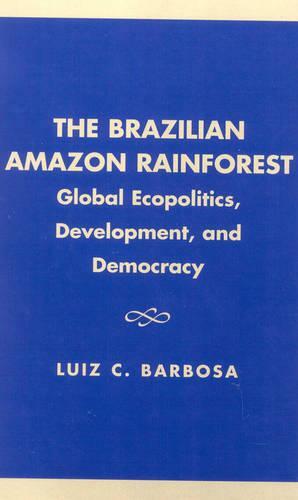 By the mid-1980s, changes in global ecopolitics and the onset of democracy in Brazil paved the way for new environmental preservation laws. Barbosa's study is unique in showing the impact of global processes on third-world environmental degradation and in its claim that democracy can facilitate preservation. The latter point is further emphasized in a comparative chapter in which Barbosa demonstrates the importance of democracy for environmental preservation in Costa Rica, Malaysia, and Indonesia. Sociologists and anthropologists interested in issues surrounding economic development as well as environmental activists will find much to their liking in this work.